There are moments when certain developments challenge your long-cherished beliefs about the business you are in. These developments pose questions that make you wonder if you were wrong to begin with, about the assumptions you made about your business, its core values, and about the customers you hoped you would attract. One such development came in the form of a series of emails we received through our website query form. These visitors to our website knew about other service providers that provided self-published books almost instantaneously (within a matter of minutes!!) and wondered how we were okay not offering our customers similar turnaround times. Our company, CinnamonTeal Design and Publishing, called CinnamonTeal Print and Publishing at its launch in 2007, was the first in India to provide self-publishing services. Within a few months of launching our services, we were contacted by the US-based self-publishing house, AuthorHouse. They wanted to know if we would extend their DIY publishing service to our customers in India, in return for a fee (the exact terms of the contract are now hazy). We jumped at the idea and they were gracious enough to help us with the design and development of the required tools. But a few months into this relationship we saw why this might not work for us. 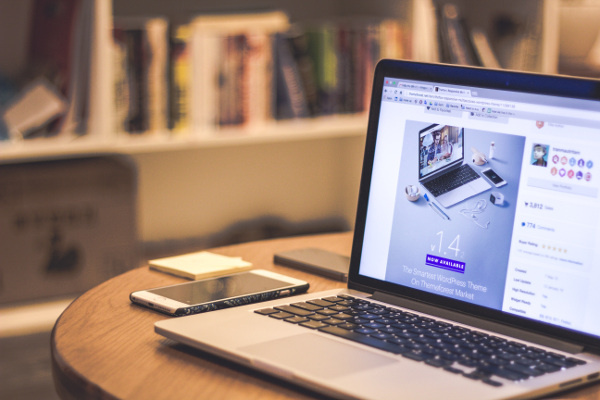 For our ideal customer, we had in mind an author who was sure of her craft, yet hesitant to discard the established best practices of publishing. She wasn’t cocky; while she knew she could write well, she didn’t hesitate to ask for editing help, nor did she cut corners with the process a good book should entail. This author knew that publishing is hard work, that getting a book out there and giving the buyer, a reader who would spend time and money on her book, their money’s worth, involved a lot of effort. So, for this author, jumping the line wasn’t an option. For her, it did not matter how fast her book got to market, rather that her book should be as ready and complete as possible. This was the author we had in mind, and wanted to assist. DIY publishing would therefore not work for such an author. 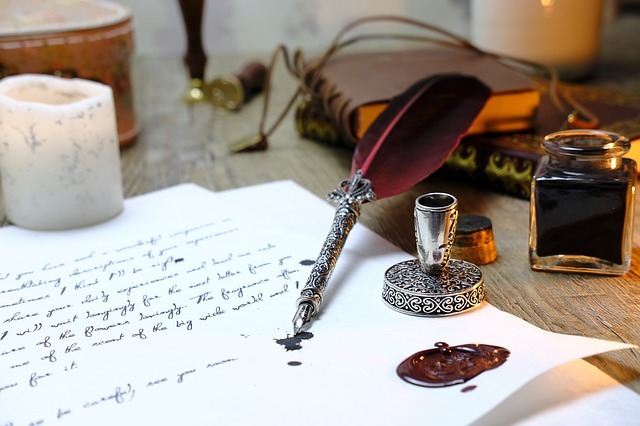 DIY publishing processes are rather suited for authors who wish to seek no help in perfecting their manuscript, who see no value in an editor who will polish their manuscripts for the better. DIY authors are in a rush to get to market – a template-driven approach, where off-the-shelf products are used to make do, works best for them. Undoubtedly, such authors have their place in the spectrum of writers, they were just not authors we wanted to work with. So when authors now come and ask us whether we will turn around in 30 minutes or less, we really don’t know how to answer them. Because our gut and our years of experience (11 now) tell us that books are not made that way. That every book is unique and that, therefore, a one-size-fits-all approach will not work for a book that must be produced exquisitely. That every book must be edited, more times than one, or at least once, thoroughly. That the cover, spine and back cover are important elements of the book, elements that the author must pay a lot of attention to. 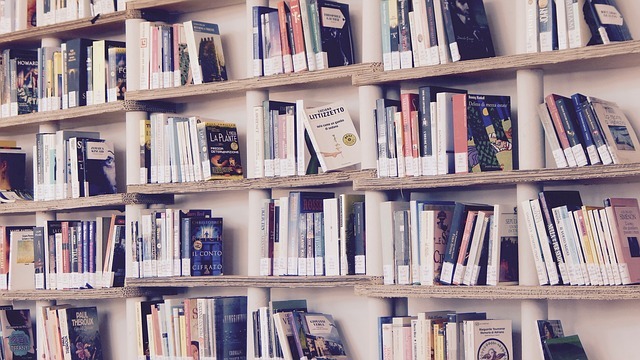 That an author must be passionate about her book and take every step to ensure that the book is widely marketed among its readership, and put in place a process that makes the book accessible to those who wish to buy it. That an author must ‘own’ the book as much, if not more, than its publisher. For now, we will continue to seek that author who believes in perfecting her art of writing, even if she is a dwindling tribe. And work with her to provide another beautiful book. For the rest there seem to be enough providers in the market, who will “turn around” faster than you can say the two words. Today’s news included a report that Macmillan was shutting down Pronoun, the self-publishing platform it had acquired in 2016. A good book should sell itself. There is no argument there. It should sell on its own merit, not because the author has garnered reputation elsewhere or because the contents of a book have stoked some controversy. The book should sell because it is well written, properly edited, nicely designed and is a pleasure to hold and read. It has been our steadfast belief that self-publishing packages do not benefit the author. 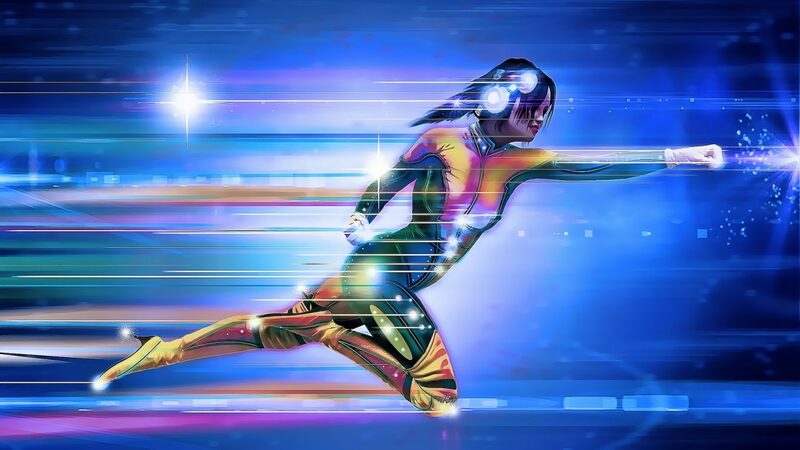 An author who chooses to purchase a self-publishing package pays for services she may not require, while being led to believe that she does, and is offered no leeway in having those services tailored to her requirements. Nonetheless, we have encountered authors who need a starting point from which to continue. They are not sure which services are important, or necessary, for their book, and how they should go about selecting a base basket of services. That dilemma forces them to consider the cookie-cutter approach so well embedded within packages. 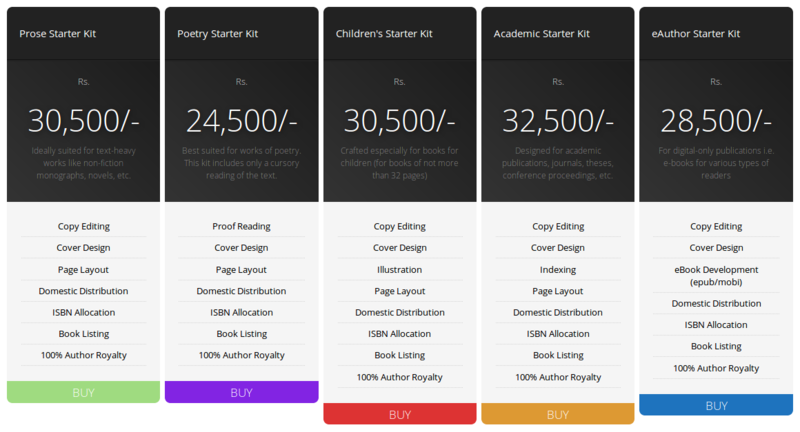 To aid for such authors, therefore, we have introduced, for the first time in India, or anywhere globally for that matter, self publishing starter kits (SKs). Like the name suggests, these kits allow you to get started with your book, and, in fact, include all the services you need to have a book ready for printing. We also have a starter kit for authors who wish to publish digitally alone. As seen in the image above, the SKs have more than only the basics included in them, knowing well that many authors are on a budget and that it is important to them that a good book be produced. The emphasis, therefore, is on producing a good book and getting it out of the door. Hence the focus of a good round of editing, and good cover design and page layout. We believe that, ultimately, the author knows what’s best for her book, and will pick and choose accordingly. More importantly, the author is still vested with choices to decide for her book. That the book is outstanding is hardly arguable. This post, however, addresses the concerns with the publisher that the reviewer has. We sought to address it through this post because it points to larger issues with publishing and self-publishing. Point taken. However, we, as publishers offer copy editing as a paid service. This service costs money when an author chooses to publish with us, and, more often than not is a service that is outright rejected by authors. To be fair, the author of this book had paid to have the book copy edited. But many authors don’t and because we insist on a round of editing, we have lost many customers – authors who are convinced that their book does not need editing. The author of this book, Satyesh Naik, had indeed paid for a round of editing. The way we provide copy editing is this: the editor edits the book, and then sends it to the author for approval. During this stage, the author is asked to approve of the changes that are made (or reject those that he does not approve of) and address any queries the editor may have. Often, because the author is busy with other tasks not related to the book, he chooses to approve all of the changes. Sometimes an author does not know better and approves of all changes. And sometimes, the editor errs by overlooking an error or two. But in most cases, an author outright rejects the changes suggested by the editor, citing that it is their (the author’s style) of writing that way. We are thus unable to enforce these changes, and the error-ridden text makes its way to the book. Due to these many human interventions, it is true that a few errors go unnoticed, or, worse, go through with the author’s approval. Editors who have applied to CinnamonTeal will attest to the fact that our editing tests are rigorous. Having the best editors gives us the ability to edit a manuscript and make it error-free. Nonetheless, it is our constant effort to ensure that the book does not have issues, the kinds of which the reviewer has pointed out. It is true that there should have been an index and that there should have been more pictures. But one should remember that this is a paid service and that the author, in this particular case, and quite often otherwise, is working on a tight budget. Indexing costs money and so does including more pictures in colour. It was also a technical constraint we had – of not having the capability to intersperse coloured pictures within the text without incurring a large printing cost (hence the decision to place pictures at the end of the book was made to reduce the costs as much as possible). Given these financial and technical constraints, we worked with the author to make the book as appealing as possible. At CinnamonTeal, we do not force any services upon our authors (except insist that the book be edited), rather allow them to pick and choose the services they need, and can afford. That we provide a print-on-demand facility allows authors to develop books at very low investments. One most also note that the author, before approaching us, had approached traditional publishers. Not one, however, found it a book worth publishing. 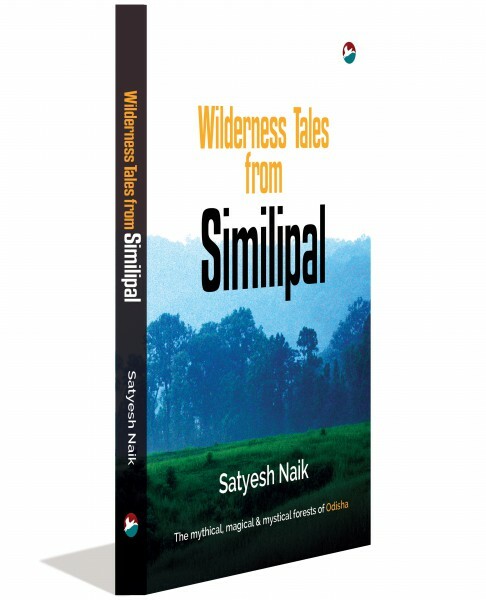 This, notwithstanding the fact that important books, especially ones like these that document important forest habitats and other aspects of nature, need to be published (we have since published yet another book, The Vanishing Stripes, an excellent addition to prevailing texts on the subject of animal conservation). The whims of publishers not withstanding, such books can only be then published via the self-publishing route. 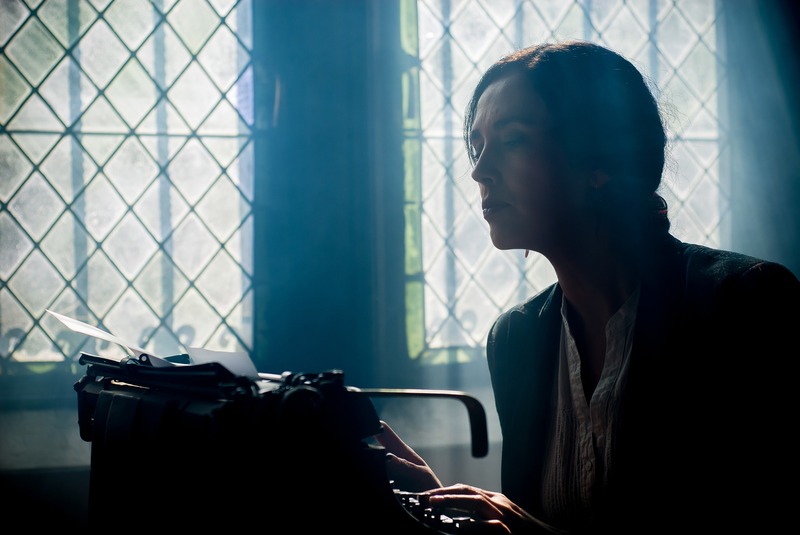 And while it is expensive to do that, and comes along with issues that still need ironing out, self-publishing is, nonetheless, becoming a genuine option for serious authors. In August 2017, we will complete 10 years since we first published a book under the imprint of CinnamonTeal Publishing (our parent company, Dogears Print Media, was launched an year earlier, in 2006, with the launch of the online bookstore, Dogears Etc.). Incidentally the launch of CinnamonTeal Publishing meant that it was the first time ever that self-publishing was introduced in India at a business-to-consumer level (it was already present at the business-to-business level). Over the years since then we have worked on many different kinds of books and have several stories to tell. This story, however, is of our association with Sulekha.com, and other organizations like them. During the years 2008-2010, Sulekha.com, which ran Blogprint, a popular blogging platform, decided to publish the blogs of its most popular bloggers as a book. 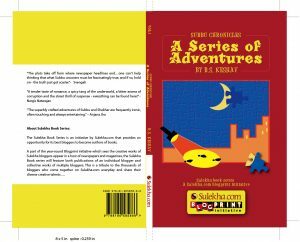 The first book, titled “Subbu Chronicles: A Series of Adventures” was released in mid-2008. 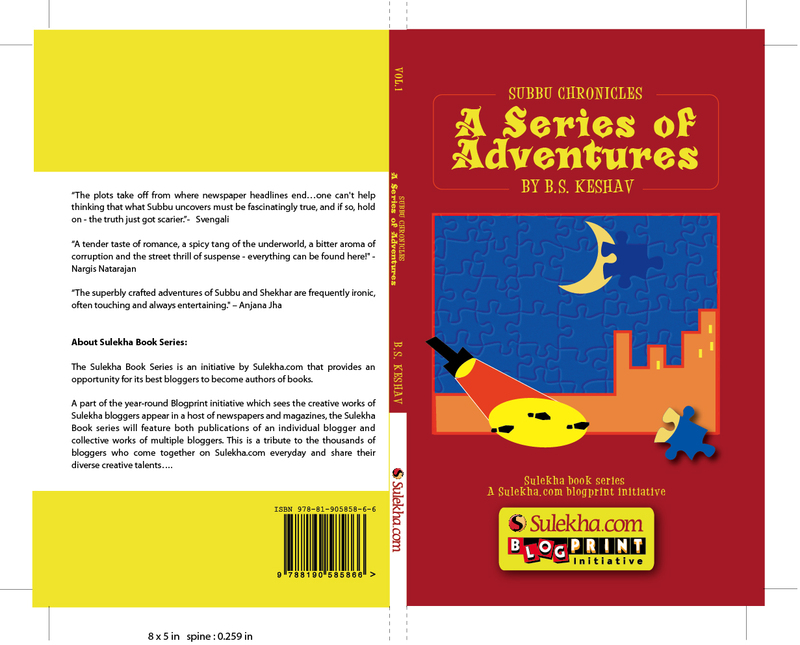 While the cover for the book was designed by Sulekha.com, CinnamonTeal designed the book interior, printed the book and arranged for its sale on indiaplaza.com, and subsequently on a certain, newly-minted, flipkart.com. 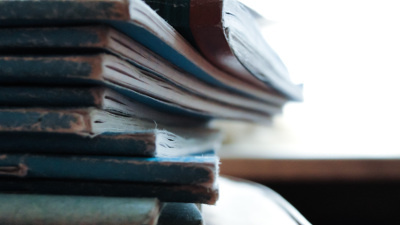 In the years since we have worked with several institutions and organizations to develop books, manuals, conference proceedings, in-house publications and other printed material. In these cases, the concerned organization provided us with material for the book, while we edited, designed and/or printed the book, depending on the needs of the client. In such an association, there is an implicit understanding that the strengths of the organization we work with are best at developing content for books, while we have significant expertise in publishing the book and bringing it to market. The Madness Starts at 9: This was the last in our series of books published in association with Sulekha.com. A total of 8 books were published, including a travelogue and an anthology of poems by women. The Global Information Society Watch, and other publications by the Geneva-based Association for Progressive Communications: We worked with the APC to print their books (which mostly consisted of annual reports and other publications) and distribute them globally. Study material for Indian Astrobiology Research Centre: Our print-on-demand service allowed the Centre to keep their study material updated. Books for the Rosary College of Commerce and Arts, Navelim, Goa: The books included Socio-Economic Inequities and the Health Sector – Issues and Perspectives and their quarterly journal, Gyaana. Books on Six-Sigma: These books were authored by N C Narayanan and published on his behalf by CinnamonTeal. Speaking with Hands: A coffee-table book that describes the various crafts of India through the eyes of travelers, many of who are from outside India, and all of who are craftspersons in their own right. Published for the founders of Indebo, a travel company. epiSTEME-5 and epiSTEME-6: The proceedings of epiSTEME-5 and epiSTEME-6, the fifth and sixth in the series of biennial EpiSTEME conferences, organized by the Homi Bhabha Centre for Science Education, a National Centre of the Tata Institute of Fundamental Research, Mumbai, India, which review research in science, technology and mathematics education. Ten years on, and countless such books later, we have formalised these services into what we have labelled “Managed Publishing Services”. The idea behind it is the same: we let our clients do what they do best (collecting and arranging original content) and what is comfortably within their domain of expertise, while we bring our publishing experience to bear on the project, effectively translating a work-in-progress manuscript into a complete book, ready for its market. 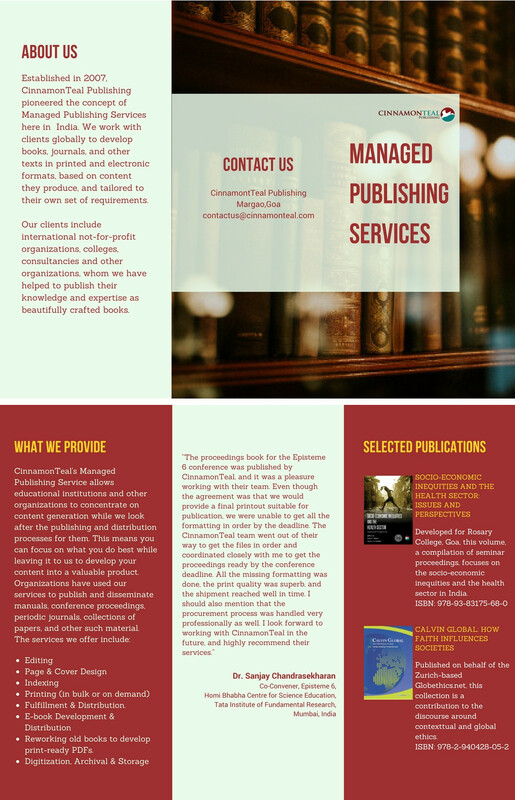 In combination with our services for publishers, we now have a full portfolio of services for all customers who wish to have a book published and marketed. Our large distribution network ensures that the book is available in all major markets across the world. And our digital marketing services helps readers know about your book, sufficiently enough to make an informed purchase.